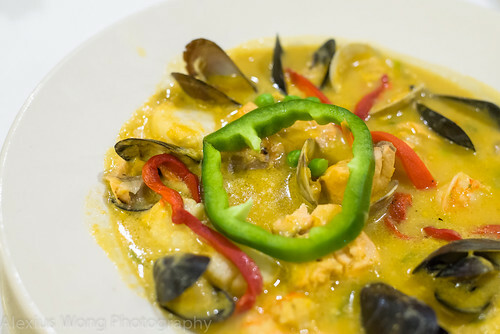 Some time ago, I posted on a Pan-Latino restaurant located in the Dupont Circle area (read blog), serving tantalizing dishes hailing mainly from the lower half of Latin America, notably Bolivia, Peru, and Venezuela. But another Pan-Latino restaurant had been on my mind for some time, making its presence on my radar for quite a while even before writing on the above locale. Since a former colleague lived in that neighborhood and had invited me there for lunch a couple of times, I paid a few visits to this establishment for dinner before writing this blog. Samantha’s Restaurant is located on the traffic-laden University Boulevard, the congestion further exacerbated by its location on perhaps the busiest intersection in Silver Spring/Takoma Park, an area renown for its immigrant population especially from Central America. But it is very easy to miss the restaurant’s location due to its shotgun building, compounded by its storefront sign blocked by a verdant healthy-looking tree. But unlike Café Citron which was featured in the above-mentioned blog, Samantha’s menu focuses on dishes from Central America and Mexico, primarily dishes from El Salvador. Here are some of their offerings. One senses the place’s Central American identity off the bat from its drink offerings. 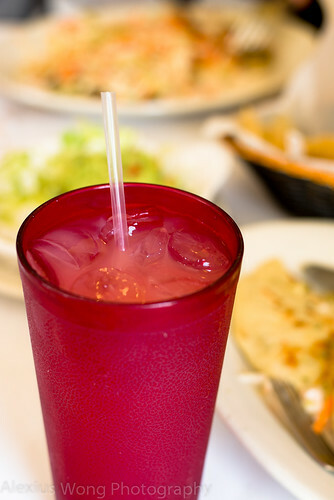 The usual regional drinks can be found here including Horchata (made with almond, milk and cinnamon), Tamarindo (a sweet tamarind drink), Maracuya (Passion fruit juice) and Marañon. The last item is made from the Cashew fruit which is popular in El Salvador, a juice not heard of from the region in Asia that I hail from even though only the Cashew nut is widely consummed. The flavor is a bit tart with tannin-like qualities, leaving behind a slight camphor-like aftertaste that reminded me of nutmeg juice that I tasted last year in Malaysia. I have to admit that I enjoyed this juice with each sip playing a guessing game on my taste buds due to the novelty of its flavors. This glass of fruity sip was what I needed to set the tone for my meal as it whisked me away to another world of flavors. With a sizable Salvadorian presence in the DMV region for some time now, Pupusas have made its foray into the local diet, both to non-Salvadorian Latinos and the Gringo. For the uninitiated, it is basically a grilled stuffed tortilla. 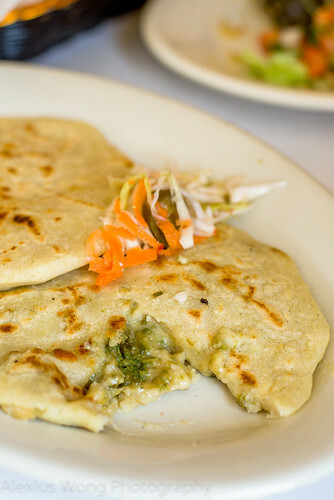 Here, there is a wide offering of Pupusas stuffed with either cheese, beans and cheese, meat and cheese, meat, zucchini, chicken, spinach, seafood, or Loroco. The latter is a flowering bud that grows on vines commonly found in El Salvador and Guatemala. A bite into my order was a complete revelation: the Loroco leaf exuded a smokiness that astounded me for being a flower that was capable of piquing my curiosity, while the mild yet creamy cheese played a complementary background partner, encased by the moist and fresh tasting corn masa harina exuding its hominy notes. The pickled cabbage, chili and carrots strips, curtido, was the necessary acid relief to the starch and diary. Another order made with seafood was equally eye-opening for this diner, having savored it for the first time in this restaurant. The stuffing was a combination of mild creamy cheese, fresh shredded crabmeat and studded with pieces of small shrimp. My tastebuds were impressed by this combination which beckoned the diner to anticipate another plateful of the same order in future visits. My friend’s order made with zucchini was equally satisfactory for her. Pupusas are definitely the strong suit in this house. 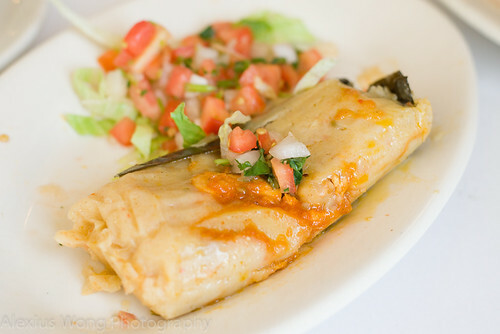 Another Central American and Salvadorian favorite offered here is Tamales. The versions that I have eaten in other locations have usually been a bit disappointing due to its dryness and compact dough which made only a few bites the necessary quota for its tasting. However, what landed on my plate at Samantha’s was au contraire. This version was wrapped in banana leaves which exuded its vegetal aroma while imbedding its leafy goodness into the dough. Each bite into this concoction only brought me a wider smile with its silky smoothness as well as the dough’s lightness, tasting savory from the use of stock and strips of moist chicken. This well-made rendition reminded me of those prepared by the grandmother of a Salvadorian friend whose tamales are a hit in her Gaithersburg community. Well, this version here definitely hit the right notes for me. 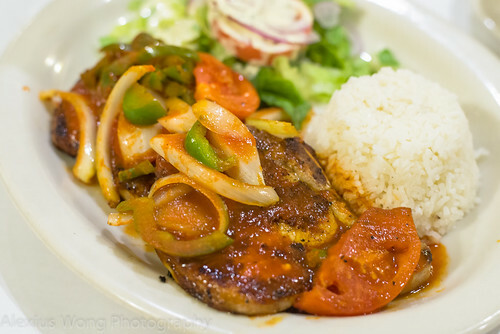 During a visit for dinner, a companion’s order was Chuletas de Puerco. Two pieces of fried pork chops arrived slathered with a light tomato-based sauce coating sauteed pieces of tomato, onion, and green pepper. Cutting into a piece of his meal, I could taste that the chops were marinated and seasoned well, hinting of notes of soy sauce which is popular in some Latin American cuisines, which added to the right Umami savoriness to the meat. The pork was well-cooked without the tough leatheriness one finds in other versions. However, the porcine flavor in each bite was a bit strong for me, which seems to be a common reoccurring theme with this meat in this country. But such inherent flaw did not deter my friend who enjoyed every bit of his dish. For my order, I decided to try the Stuffed Chicken with Spinach and Mushroom. A huge piece of chicken arrived on my plate which seemed rather daunting on first impressions. But cutting into it revealed its true nature: a piece of chicken breast had been pounded very thin wrapping a stuffing of spinach, mushroom, onions, and bits of green pepper. The piece of poultry was still rather moist (amazing for sauteed breast meat), lightly seasoned with a hint of cumin in the seasoning mixture. But what really grabbed my attention was the filling consisting of fresh spinach leaves (thank goodness not the frozen kind), woodsy mushrooms, sweet onions, and vegetal notes from the green pepper. The thin coating of a lightly creamed spinach sauce added the necessary moisture and savoriness to the whole mix, which made for a rather quick disposal of my portion of this dish. This was definitely a light and tasty poultry dish worth ordering. Another companion’s dish was Zarzuela Andaluza. A bowl arrived with pieces of seafood gently stewed in a yellowish sauce and topped with strips of roasted red pepper and the unnecessary green pepper ring which was purely decorative – basically, a seafood paella dish without the rice and saffron, an obvious tribute to La Madre Patria, Spain. What impressed me about the dish was the pieces of scallop, salmon, and shrimp that tasted fresh and cooked just right without getting tough. 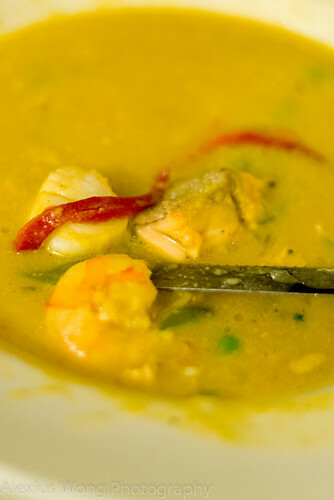 The stew soup was very savory tasting of a good seafood stock made creamy from a hit of diary. However, after a few spoonfuls, the hot liquid did start to taste rather one-note and it was crying for some herbal notes. My friend did complain about the mussels and clams that appeared anemic to my eyes, which was not exactly tempting for this reviewer to give them a try. Fortunately, with no casualty from my friend’s health the following day, I can confirm that the mollusks were just fine, just a bit sad-looking and beyond their prime. The ubiquitious Paella is also on the menu, if you are in the mood for more Iberian-inspired cuisine. 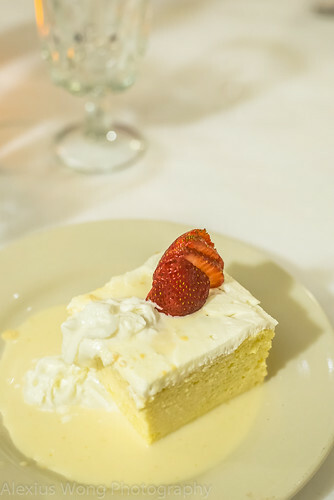 For dessert, one of my dining companions went for his perennial favorite – Tres Leches. A taste of this standard Latin dessert revealed a skillful hand in its making. It was incredibly light, sweet without its usual cloying quality, a bit heady from a good hit of vanilla, and creamy rich without the stodginess. The above qualities of this uber-cake totally defied the nuclear potential that this sweet bite possessed, and the other diners, including me, were tempted to dig more into the sweet square, if were not for the protection of the orderer of his prized finale. My motto of “Desserts should only be consummed when the calories are worthwhile” holds true here, albeit the caloric count is in the thousand. But this is probably the best Tres Leches to this day, and worth every morsel of it. 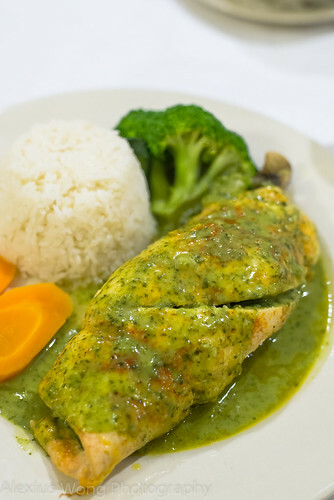 Samantha’s Restaurant stands above the usual Central American eateries for its offering of standard fares with a level of culinary skill not usually found in most places of this cuisine. The simple and humble Pupusa and Tamal are elevated to something exciting by the inventive addition of seafood as well as proper attention to their making. Even the main dishes of Pork Chops, Stuffed Chicken, and Seafood Stew showed a level of refinement that elevated these rather simple dishes, notwithstanding some minor flaws. The ending dessert of Tres Leches only confirmed that the kitchen knows what it is doing and that there is a knowledgeable hand in there. 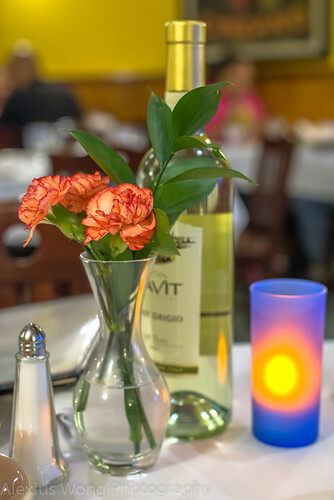 Looking around the dining room, you sense that the customers are locals who frequent this establishment. The decor maybe incongruent with its large Art Deco Italian/French posters but the smart and efficient service makes up for it. Ah, not to mention the cooking and the dishes that would tempt most diners to go back for more of their delicious offerings.